How much sleep we need never really lines up with how much sleep we get, at least for most adults in the United States. About 30% of adults in the US sleep less than six hours a night (I’m definitely in this group). Sure, we think we function alright, but do we really? Many of us are so used to being sleep deprived that it has become our new normal and we don’t know what it feels like to be full rested on a regular basis. Adults who find themselves in this six hours or less situation during the week usually take advantage of the weekend (or days off) to get a full night’s rest. Not so for ultrarunners who tend to get up even earlier on the weekends than they do during the week to get their long run in before the day really gets going. Going through life in a chronically sleep deprived state has health consequences and performance consequences. It’s associated with higher risk of mortality and increased chronic diseases. Athletes need more sleep than most, which makes perfect sense. We spend our “leisure” time breaking down our muscles and depleting our bodily systems. If our sleep is interrupted or cut short, our ability to repair muscle, consolidate memory, and release hormones is compromised. As ultrarunners, we should be getting seven hours a night minimum and up to about ten hours. Our reaction time (important on the technical trails), accuracy (also useful on trails), and speed can increase with additional rest. Our bodies have a preprogrammed rhythm when it comes to wakefulness throughout the day-Circadian rhythm. 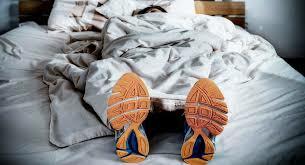 Between the hours of 6-9 a.m. cortisol and body temperature increase waking most of us naturally. Between the hours of 1-3 p.m. we have a natural dip in our energy and then it picks back up between 5-9 p.m. This early evening pick-up means taking a nap after work is difficult and so is going to bed early. From 2- 6 a.m. is a low point and if you’ve ever run through the night you know that those are the most difficult hours and the most crucial. Having a pacer is essential and a good caffeine plan. Once the sun comes up, you’re re-energized at least for a few hours. Countless ultrarunners start their day between this 2-6 a.m. time, especially, when doing long runs. Another issue, kind of a tangent, with being out during these hours is our core body temperature is at its lowest. I’ve always said the outside temperature always dips at 2 a.m. but it’s not the outside temperature, it’s my inside temperature. This is something to be aware of when you’re packing your drop bags for the night time aid stations. So, what’s a runner to do? Let’s start with the “easy” stuff. Do everything you can to prevent your sleep from being interrupted. If you have children, this can be impossible. Next get to bed an hour early or stay in bed an hour later. Get in a 20-30 minute nap over lunch when ever possible. If you have a hard time falling asleep, establish a bedtime routine. Make sure electronics are off an hour before lights out. Keep lights low a half an hour before you go to bed. Turn down the temperature in your house. Listen to relaxing music or a meditation. Read a book rather than watch TV. Before an event, make sure your taper includes more sleep.